The Nickel Bar, which opened just recently, is already getting some attention. Is it because it has taken the place of the beloved Il Grano, West L.A.&apos;s former vanguard of fine Italian dining? Not really. It&apos;s because the gastropub, in an apparent flair of whimsy, decorated their restroom doors with pre- and post-transition pictures of Caitlyn Jenner. The one pre-transition image signifies the men&apos;s room and the post-transition image...well, you can probably figure out the rest. The designs have even caught the attention of TMZ—which is probably the whole idea behind the stunt. Specifically, the pre-transition image is taken from one of Jenner&apos;s iconic Wheaties boxes. Back in 1977, when she was known as Bruce, Jenner was capitalizing on her success at the 1976 Olympics when she became a spokesperson for the General Mills breakfast cereal. And, when Jenner revealed in 2015 that she was transgender, the boxes became a collectors&apos; item on eBay, fetching several hundreds of dollars from bidders, reports Time Magazine. The image of Caitlyn is taken from her (similarly iconic) magazine cover for Vanity Fair. The headline on the July 2015 issue—"Call me Caitlyn"—was a bold declaration. And it was the first time in history that a transgender celebrity was put on such a visible platform. 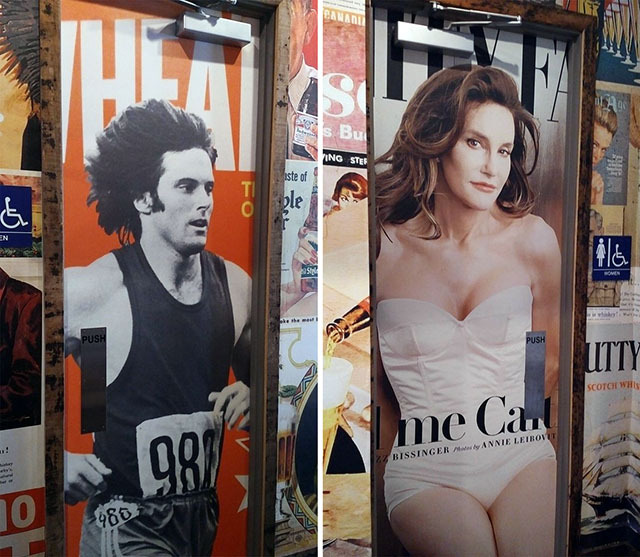 Considering that the two images are taken from two touchstone periods of U.S. history—one evoking the American sense of optimism as the nation was still coming to terms with the Vietnam War, the other signifying a turn in public perception of gender identity—perhaps it&apos;s a bit gauche for a gastropub to use the pictures for its own purposes. It&apos;s not just the winky-eye joke that&apos;s tacky, but also the fact that this was (likely) done for Instagram-able publicity. LAist has left a message for The Nickel Bar. We will provide an update when we hear back from management.